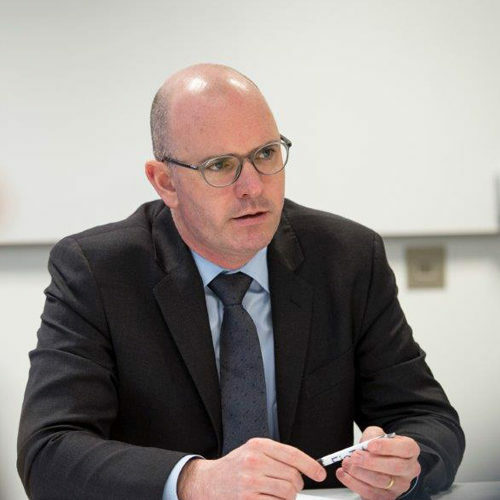 Darragh McCarthy is a graduate of UCD (BComm International – German) and started at Morgan Stanley in 1994, where he remained until late 2012. During his time at Morgan Stanley, Darragh was based in London, Frankfurt and New York and held various responsibilities including COO for Institutional Securities, COO for EMEA, Head of Fixed Income Sales North America and Head of Fixed Income Sales EMEA. Darragh founded FinTrU in 2013 with the aim of creating high-quality professional employment on the island of Ireland. During his time at Morgan Stanley, Darragh recognised the increasing demand from Global Investment Banks for high-quality resources to navigate the ever-increasing regulatory landscape. FinTrU’s products are: Legal, Risk, Compliance, KYC, Operations and Consultancy. FinTrU’s clients are all Tier 1 Investment Banks based in London, New York, Tokyo, Frankfurt and Paris. FinTrU currently employs 250 staff in Belfast and has significant further growth plans. Originally from County Cork, Darragh is married with three children (two daughters and a son) and now lives in Belfast. Katrien, his wife, is the FinTrU Chief of Staff and his business partner.